“Everyone Can Be a Ninja” uses Akbar’s life experiences to inspire. In just three months, American Ninja Warrior host Akbar Gbajabiamila will be a published author! On the show, he’s known for his endless enthusiasm and quirky puns. While his book definitely has an optimistic tone, the subject matter is much more down to Earth. Akbar revealed his intention to publish a book way back in October, with a series of videos on his Instagram page. WAIT FOR IT!… WAIT FOR IT! . I’m am excited to share with you that DROPPING THIS MAY, my book “EVERYONE CAN BE A NINJA”. The process of writing this book has been an awakening for me. A chance to explore my life, the people who have shaped it, all with the hopes of inspiring others. I can’t wait to share #EVERYONECANBEANINJA this spring with all of you! 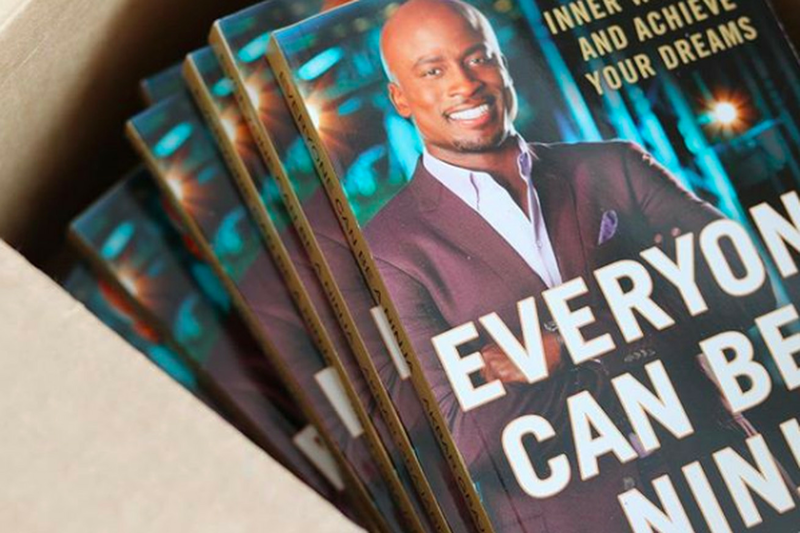 His book, “Everyone Can Be a Ninja” draws from his childhood, time in the NFL, and, of course, his experiences with American Ninja Warrior to relate back examples of how we all posses the ability to shape our lives. “Through his own inspirational underdog stories and interviews with modern-day ninjas who have accomplished extraordinary things in their own lives against the odds, Akbar proves in Everyone Can Be a Ninja that it doesn’t matter if you make it through every step of the obstacle course on the first try. Ninjas keep pushing themselves until they reach their goals, and they don’t let anyone or anything stand in their way. We just received our early copy of the book and we’re so excited to settle in and read it. The book is available for pre-order now and will be released on May 7. Who plans on snagging a copy for themselves?